Castile Soap has long been known to generations of Americans and Europeans as the purest, mildest soap available. 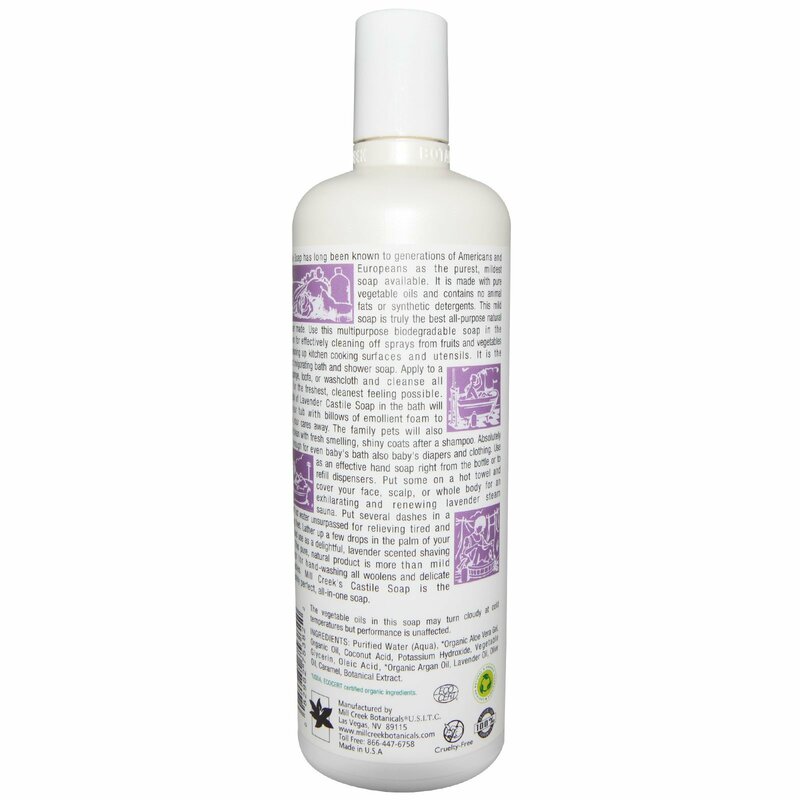 It is made with pure vegetable oils and contains no animal fats or synthetic detergents. This mild soap is truly the best all-purpose natural cleanser made. Use this multipurpose biodegradable soap in the kitchen for effectively cleaning off sprays from fruits and vegetables and cleaning up kitchen cooking surfaces and utensils. It is the perfect invigorating bath and shower soap. Apply to a wet sponge, loofa, or washcloth and cleanse all over for the freshest, cleanest feeling possible. A capful of Lavender Castile Soap in the bath will fill your tub with billows of emollient foam to soak your cares away. The family pets will also come clean with fresh smelling, shiny coats after a shampoo. Absolutely mild enough for even baby's bath also baby's diapers and clothing. 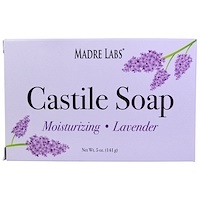 Use as an effective hand soap right from the bottle or to refill dispensers. Put some on a hot towel and cover your face, scalp, or whole body for an exhilarating and renewing lavender steam sauna. Put several dashes in a pan of hot water unsurpassed for relieving tired and aching feet. Lather up a few drops in the palm of your hand and use as a delightful, lavender scented shaving soap. This pure, natural product is more than mild enough for hand-washing all woolens and delicate washables. 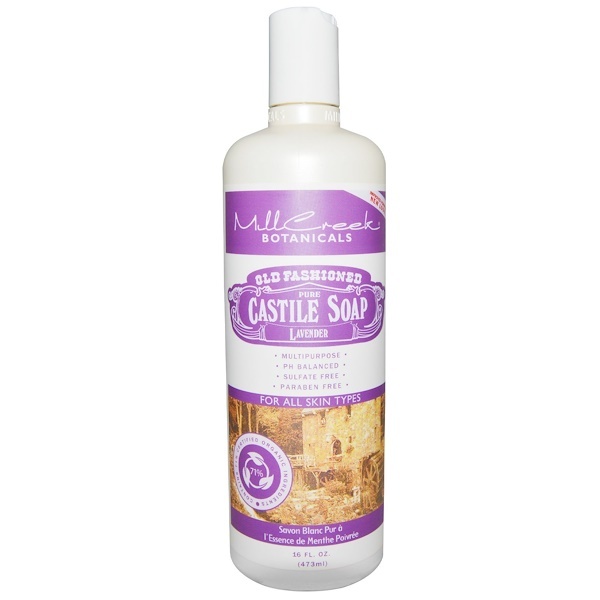 Mill Creek's Castile Soap is the absolutely perfect, all-in-one soap. Очищенная вода (aqua), * органический алоэ вера гель, органическое масло, кокосовая кислота, гидроксид калия, растительный глицерин, олеиновая кислота, * органическое аргановое масло, лавандовое масло, оливковое масло, карамель, ботанический экстракт. * USDA, Ecocert сертифицированные органические ингредиенты. The vegetable oils in this soap may turn cloudy at cold temperatures but performance is unaffected.